Indie Retro News: JAWS : The Text Adventure - A brutal text based adventure for the ZX Spectrum! JAWS : The Text Adventure - A brutal text based adventure for the ZX Spectrum! 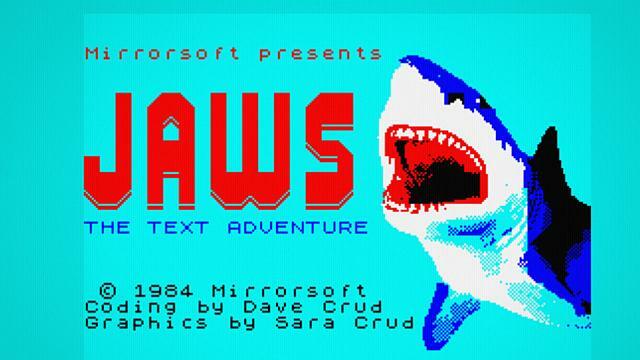 Many years ago in the early 80's Mirrorsoft commissioned Dave-Sara to create a ZX Spectrum game that had a movie tie in with the hit horror classic Jaws. Yet sadly it wasn't meant to be as it remained unreleased at least until much later when Matt Round released the "Jaws: The Text Adventure" for playability in your browser. But it seems gamers were not content with just a HTML release as Einar Saukas has now ported the HTML version for the ZX Spectrum, a 100% authentic feeling! Using Sinclair BASIC statements, JAWS the texture adventure is a pretty fine retro based game, that has you playing as the dreaded shark in a task to eat as much as possible. Although it doesn't have any in game music, just beeps. JAWS is certainly appealing as you'll be eating animals and people and for those that don't get eaten, scared out of the water. It's strange to think that it has taken this long to finally end up on the ZX Spectrum, a game that by right should've been on the ZX first and not as a HTML release. But whichever version you decide to play, it's a damn fine adventure and really does feel like you are JAWS!